Now that UFC 143 is in the record books, the organization has announced the five main bouts that will air live in their next show on FUEL TV. 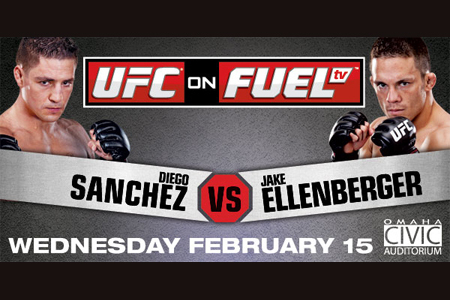 “UFC on FUEL TV: Sanchez vs. Ellenberger” takes place February 15th inside CenturyLink Center in Omaha, Nebraska. A middleweight brawl with Aaron Simpson and Ronny Markes, heavyweights Philip de Fries and Stipe Miocic and bantamweights Walel Watson and TJ Dillashaw will round out FUEL’s live televised lineup. The network’s broadcast begins at 8PM ET/5PM PT.